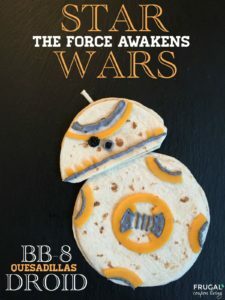 Awaken your little Jedi’s taste buds with this Droid Quesadilla! Total comfort food from such simple ingredients in the shape of your favorite droid. Imagine the smiles when their lunchbox opens to find this. Add a clever touch to a Star Wars birthday party by making a tray full of these to enjoy! May the force be with you. Additionally you will need a white wine glass, pairing knife and ziplock bag. In a small bowl, mix your softened cream cheese with a dab of black food coloring until you get a silver grey color. Turn a ziplock bag inside out over your hand and scoop up the silver cream cheese reserving a small amount in the bowl. Turn the bag right side in and press the cream cheese mixture into one corner of the bag. With a sharp knife, cut the corner of the sandwich bag off so that you have a small hole from which you can pipe the cream cheese. The smaller the better. Add more black food coloring to the reserved silver grey cream cheese until you get a jet black color. Take one cheddar cheese slice and place it on a cutting board. Invert your wine glass and use it to cut a solid circle in the center of the slice. Take that solid circle of cheese and with a pairing knife freehand another small circle in the center. It should now look like a cheese doughnut. With your pairing knife, cut four concentric sections from the inside hole leaving four small interior spokes. This will form the center mechanism of your droid’s body. Take your other slice of cheddar cheese and place it on the cutting board. Invert your wine glass and use it to cut a solid circle in the center of the second slice. Take that second solid circle of cheese and with a pairing knife cut it into four equal pie pieces. With your pairing knife, cut the rounded edge of each pie piece forming four equal quarter rounds, about the same thickness of your center mechanism piece. These will form the four side pieces of your droid’s body. Take the remainder of one cheddar cheese slice and with your pairing knife cut a section from around the edge of the rounded hole for the droid’s head stripe. This should be about a quarter inch in width. From the remainder of the other cheese slice cut various size squares and rectangles to attach as decorative pieces along the bottom grey head stripe. Cut your second flour tortilla in half across the diameter. With your knife cut the corners of the tortilla to round them up a bit. Cut one of the scrap pieces of tortilla to form the antenna that will go on top of the droid’s head. 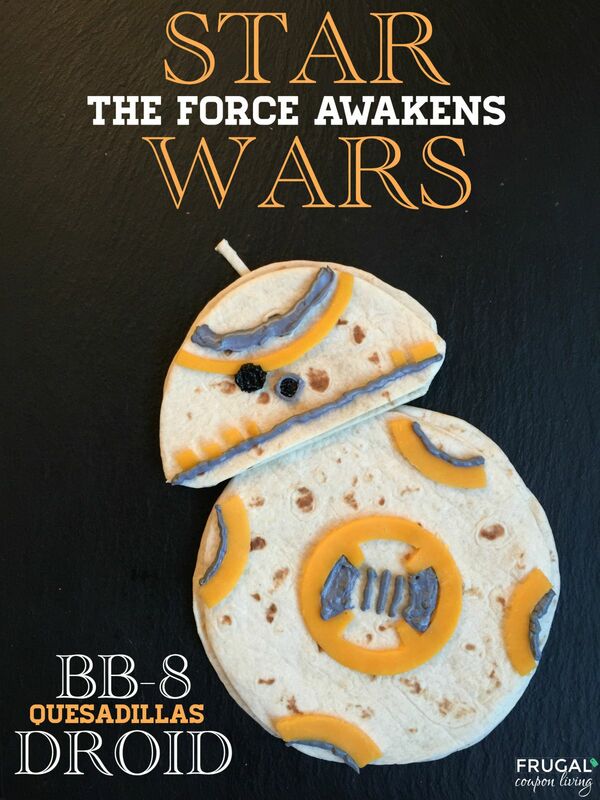 Place your droid’s round quesadilla body on a microwave safe plate. Sprinkle with 2/3 of the Mexican cheese blend. Top shredded cheese with the other round tortilla. Repeat this process with the droid’s tortilla head. You should now have two cheese quesadillas. Place all cheddar cheese sliced pieces on your BB-8 Droid as pictured and pipe silver grey cream cheese in areas shown. With the tip of your knife, place a small dab of black cream cheese on your droids head and an even smaller dab below and to the right of it as shown. Pipe a silver rim around the smaller dot of black cream cheese. Place your droid’s head on its body and top with the tortilla antenna piece. 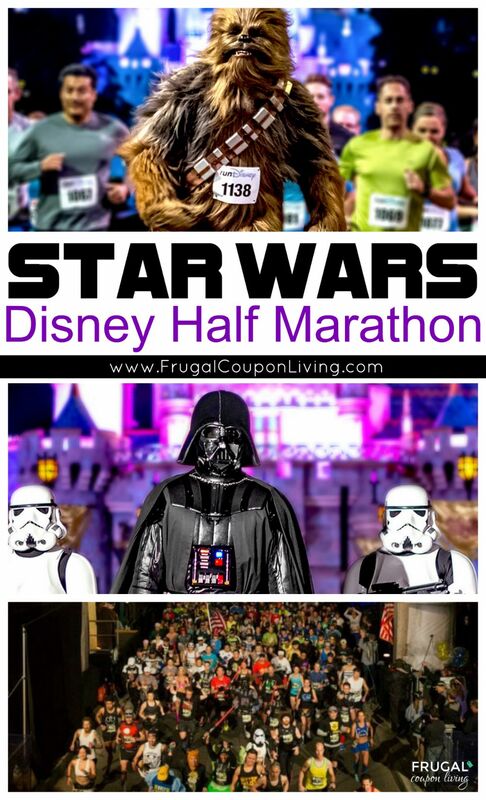 Don’t forget these Disney Star Wars Half Marathon. Pin to Pinterest.